During the off season of the Chelsea galleries in New York, Art lovers from all parts flock to the lineup of summer exhibitions at the big museums. The program for this summer is nothing to scoff at – the Met boasts a Richard Serra Drawing Retrospective and Alexander McQueen exhibition that have museum-goers queuing up, while MoMA shows off Graphic Impulse, an impressive show of German Expressionism that has been a big hit. The hype from Graphic Impulse may pull attention away from another gem currently on view at MoMA; an exhibition entitled Francis Alÿs: A Story of Deception. The title of the show couldn’t be more appropriate. Alÿs’s work is indeed deceptive, presenting itself with the aura of being serious and relevant in a deadpan fashion but leaving you with a measure of skepticism about its sincerity. It is a puzzling yet provocative experience of artistic semantics that is not unlike an essay by the Post-modernist philosopher Jean Baudrillard. Hailing from Belgium originally, Alÿs came to Mexico City in the 80’s as an architect seeking work after 1985 earthquake. His choice to reside in Mexico clearly left an impression on him as a young artist, exposure to ideas of crisis, provocation, satire, and social constructs formed the foundation of his conceptual practice. Known for working in a variety of formats, this survey features a mixture of drawings, small paintings, short films and projection installations done mostly after 1990. 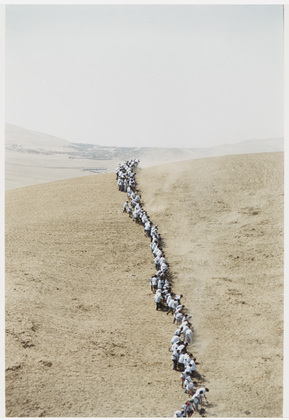 Walking into the exhibition the viewer is overloaded with work – there is no easing into Francis Alÿs.